The progress of your restore will be displayed in the Restore Manager. A notification will be displayed at the end of each restore with a link to a list of restored files. Double-click the Carbonite iconThe Carbonite logo shaped icon in the notification area by the system clock that opens your Carbonite application. in your Windows notification areaThe area next to your system clock that contains the icons of the programs you are running. 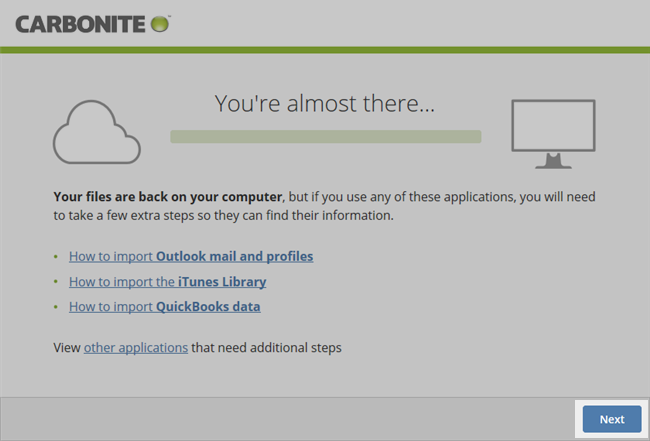 to open the Carbonite application. Note: If you do not see the Carbonite icon, it may be hidden. 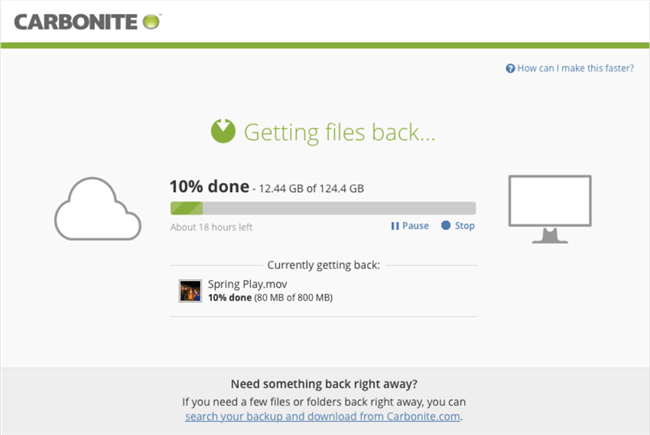 Click the Show hidden icons button ( < ) to view the Carbonite icon. In Windows 7, click the Show hidden icons button ( ^ ) to view any hidden icons. If you have Windows 8 and are not viewing the desktop, press the Windows Key + D on your keyboard to view the desktop. 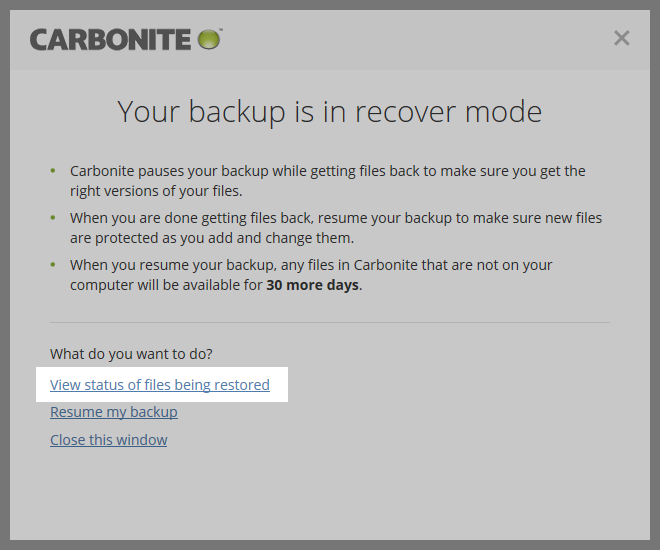 The Carbonite application will be displayed, and a pop-up notification will indicate that your backup is in recover mode. 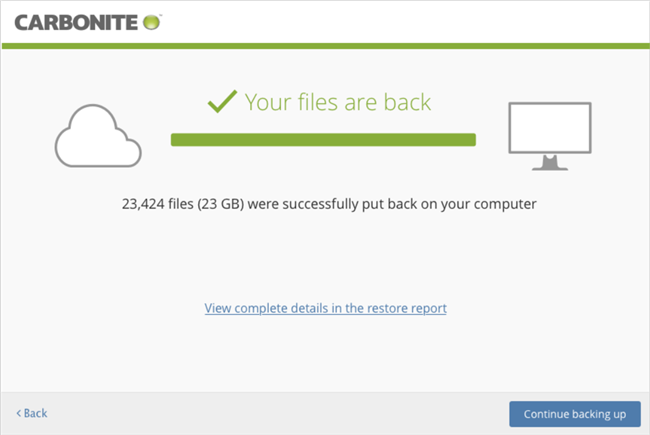 Click the View status of files being restored link to open the Restore Manager. The progress of your restore will be displayed as a percentage. Information about the file currently being restored will also be displayed. Once all your files are back on your computer, information will be displayed regarding any additional steps that might be needed in order to view restored data for certain applications. You can click on any of the provided links to view specific instructions for importing data into these applications. Click Next to proceed. Details of the completed restore will be displayed within the Restore Manager window. A printable list of restored files and instructions for importing files for certain programs can be accessed in the Restore Report by clicking the View complete details in the restore report link.